The world’s leading car brands took centre stage at the recently concluded, fifth edition of the Middle East Car of the Year (MECOTY) awards, which was held last week on 2nd April 2018, at ADNEC, Abu Dhabi, UAE. The invite-only ceremony was attended by top executives of all major automotive brands from across the region and several dignitaries, including guests all the way from Japan, USA, Korea, UK, and Germany. The night’s leading winners were Volvo EMEA and PSA Groupe (Peugeot) winning the prestigious Jury & Public COTY awards respectively, whilst top brands, including; Audi, Ford, Volkswagen, Jaguar, Land Rover, Mercedes, Honda, Toyota, Lincoln, GMC, Chevrolet, Lamborghini, Hyundai and KIA were among the winners announced in an exciting and stunning gala awards night. The nominees underwent a stringent multi-stage voting process, spanning over 10 months, by a select panel of 16 judges, who are handpicked to represent their respective countries, including; UAE, Kuwait, Oman, Egypt, Bahrain, Lebanon, Jordan & Saudi Arabia. 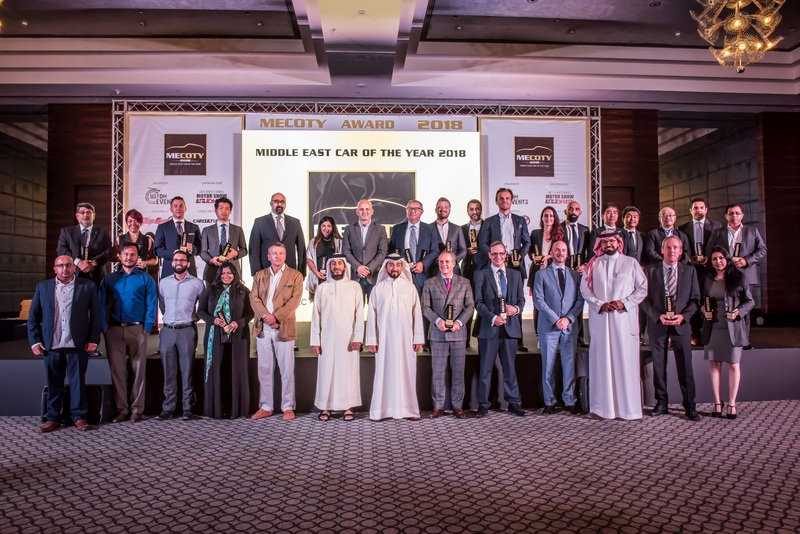 "Five years since their inception and the MECOTY awards continue to serve as the region's most comprehensive platform of automotive experts, and we, at Ford, are thrilled to be recognized each year," said Chris Probert, Marketing Communications Director, Ford Middle East & Africa. "With the F-150 Raptor and the Mustang GT350 winning top spot in their respective categories, this is testament to the great legendary vehicles that we continue to bring to our customers. Both models enjoy a rich heritage and unmatched passion for performance that continue to go from strength to strength each year." Winning a MECOTY award is a testament for manufacturers that proves that their models are in line with the regional consumer needs and re- affirms their commitment of providing world-class vehicles and services to the Middle East region, one of the largest car markets globally. "We are delighted to receive these prestigious awards for the XC60 and XC40. The way they have been received by journalists and consumers across the region, as well as by the MECOTY jury panel, is truly encouraging for Volvo Cars as a brand. The Middle East is one of our key markets and this shows us that we are on the right track." - Jesus Fernandez de Mesa, MD, Volvo Cars EMEA Importers. Peugeot’s latest SUV, 5008, which won the coveted ‘Public COTY’ award, claimed 16.3% of the 70,000+ votes received from around the world, further cementing its market position, as a brand that resonates with the regional consumer’s expectations, shortly after opening their first regional office in the Middle East. Commenting on this occasion, Cedric Zayoun, M.D., PSA Groupe GCC said: "We're very proud to have won the Public COTY 2018. People's opinions matter and this very award represents people's choice of a car that integrates safety, performance, technology and style. We stressed the importance of the GCC region amongst potential markets for Groupe PSA upon inaugurating our first regional office in Dubai last year. Ever since, we have been channelling our efforts to meet the expectations of the GCC residents. Securing the Public COTY award is another milestone in the brand's success story which underpins PEUGEOT's innovative position in the SUV segment." Audi, which holds the records for the most number of wins over the past editions, witnessed another successful night, by winning three MECOTYs and being recognised as the leader in its competing classes. "It was a great pleasure and honour to be recognised by the MECOTY jury with three wonderful awards for the Audi brand. The TT RS, RS 3 and the Audi S5 were all celebrated winners in their respective classes and show the success of the Audi Sport brand and our the premium performance models in the Audi range. With many more innovative new models to come this year, we are already looking forward to the next year’s MECOTY awards to hopefully continue our story of success." - Enrico Atanasio, Brand Director, Audi Middle East. “MECOTY’s fifth consecutive edition is truly a milestone achievement. We congratulate all the winning manufacturers, and thank the supporting authorities, media, voters and of course, our jury members for their support.’’- Saaed Al Marzouqi, CEO, Custom Events, LLC.